Designed for small spaces and easy portability, designer Tomas Alonso‘s A Side Tables can be folded flat in just seconds. Made from powder coated steel, ash and laminated plywood, these collapsible round tables come in two different handy sizes. And with one brightly colored leg and a simple finish, the low-key design is sure to fit perfectly with any decor! Designed for small spaces and easy portability, designer Tomas Alonso's A Side Tables can be folded flat in just seconds. 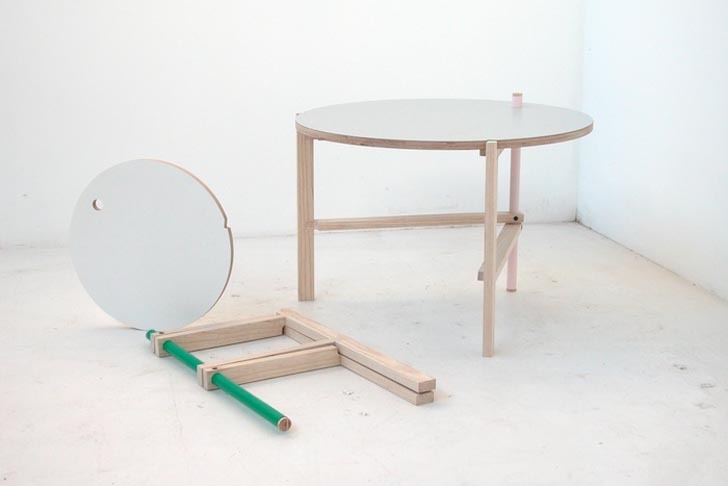 Made from powder coated steel, ash and laminated plywood, these collapsible round tables come in two different handy sizes. And with one brightly colored leg and a simple finish, the low-key design is sure to fit perfectly with any decor!